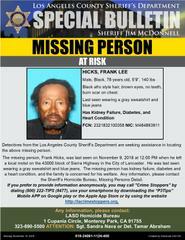 Detectives from the Los Angeles County Sheriff’s Department Missing Persons Unit are seeking the public’s assistance in locating Frank Lee Hicks. 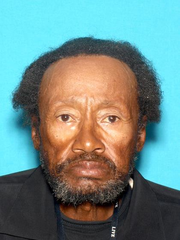 Mr. Hicks was last seen on Friday, November 9, 2018 at 12:00 P.M. when he left a local motel on the 43000 block of Sierra Highway, in the city of Lancaster. Mr. Hicks is a 78 years old Black male, 5’9” tall, weighing 140 pounds with black afro hair style, brown eyes, no teeth and burn scars on his chest. He was last seen wearing gray sweater shirt and blue jeans. He suffers from kidney failure, diabetes and a heart condition. His family is concerned for his well-being and are seeking the public’s help in locating him. Anyone with information about this incident is encouraged to contact the Los Angeles County Sheriff's Department's Homicide Bureau, Missing Persons Unit, Detective Abraham or Sergeant Nava at (323) 890-5500. If you prefer to provide information anonymously, you may call "Crime Stoppers" by dialing (800) 222-TIPS (8477), use your smartphone by downloading the "P3 MOBILE APP" on Google Play or the App Store, or by using the website http://lacrimestoppers.org.